Unusually, I was aware of this pen before I had the opportunity to buy it. The previous owner wrote about it in Fountain Pen Network and I would reference that post if I could. However, FPN’s search facility, which is never very good, is grindingly slow today and I had to give up. The pen is in worn condition and it’s almost an exercise in unoriginality but that’s neither here nor there with a pen of this quality. The seller said the cap was not original. 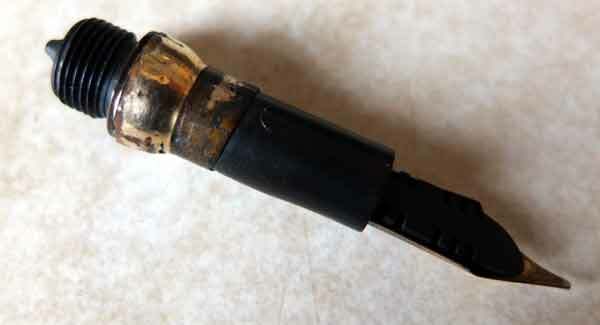 Nor is the No3 nib or the ladder feed, both of which are replacements. I may well have a nib that suits the pen better but I will leave the ladder feed. It may be an anachronism but it’s also an improvement. 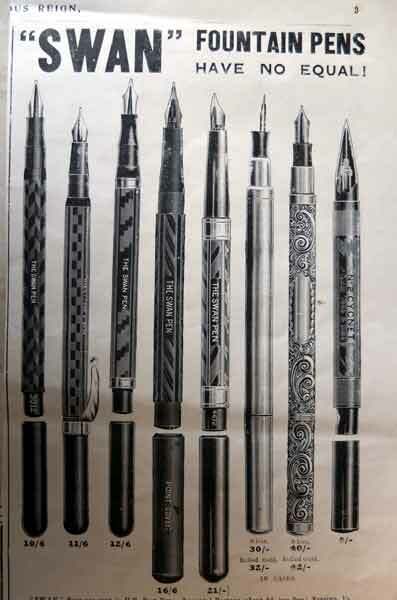 I had a look through my reference files to see if I could discover which pen it actually is. 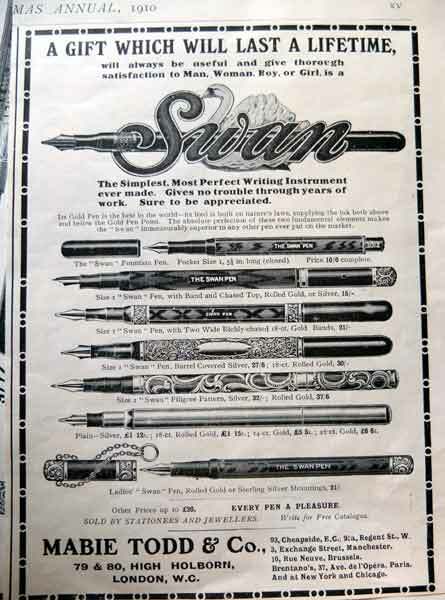 There were pens with overlay barrels and plain BHR caps as these advertisements show, but these are not this pen. 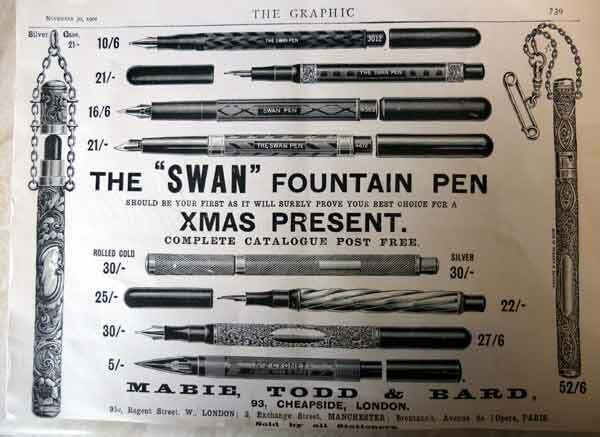 I think the pen second from the right in this 1911 advert is the closest to this pen, if you look at the metal partially covering the section. That’s the type though the date of the pen is impossible for me to determine exactly. Could this pen have belonged to the Polish composer Karol Szymanowski? I can find no good biography of Szymanowski. It is said that he travelled widely, but I can’t tell if he ever set foot on these shores. Of course, there are a variety of other ways his pen might have arrived here, some more likely than others. Perhaps Szymanowski is as common a name in Poland as Smith is here. I don’t know. The dates give no difficulty. Szymanowski lived from 1882 – 1937, so it would not be stretching things too far to say that he bought this pen in the early years of the twentieth century, then discarded it in later years when better designs came along. It’s not unlikely, either, that a successful composer and musical director with a good sense of amour propre would buy a very expensive pen and have his name engraved on it. Could this have been the pen he used to write the operas Król Roger and Hagith? We’ll never know, but it can’t easily be disproved either. Wonderful to look at, wonderful to think about. What a treasure. Even in its present condition it’s a wonderful pen. Whatever its history may be, it’s a fine memento of the Edwardian period. I missed out on another pen at auction (not Ebay) yesterday, that might have interested you, but after going two bids beyond my ‘limit’ I decided to back down. You win some, you lose some, but I still hate to see them get away! Was it you who bought the GF Mabie that the box should have accompanied? Good to hear from you. I do, indeed, like the pen. I’ve found a nib that is closer in time to the date of the pen than the English No 3 nib it had. I certainly have a short GF Swan that I bought a couple of weeks ago. Is that it? No, it was late last Summer (August time?) I believe; it was a very nice, clean little pen without any wear to the gold (it was so crisp it had me searching for marks telling me that it was solid gold!) , and had recently been serviced by Eric (Ekiethump from Edinburgh) so was even writing beautifully! I suppose it was a silly question considering the number of pens that must pass through your hands, and may not even have been you! That is the very same pen …. well remembered! I thought so. After thousands (literally) of pens passing through my hands I no longer remember them all, but I remember the outstanding ones. It must be a dream to be able to make a living out of something you are passionate about! I like to believe that, and who can say different?